As the zeitgeist in men’s style continues to move away from throwaway fast-fashion – thanks for that, global warming – men are learning to either recycle or repair their clothes. So, returning to sartorial staples, which will last a lifetime rather than being disposed of after just one season, makes a lot of sense. Enter, the denim shirt. With a history that traces through railroad engineers to rockstars, and as one of the few pieces of clothing that’s genuinely wearable year-round, it’s about as perennial as you can get. Invented as a hard-wearing shirt to ride and work in, its adoption by Hollywood stars mean that it’s inexorably linked to the images of countless style icons, with possibly the coolest denim shirt wearer being reggae legend Bob Marley, who was rarely seen out of one. And because there’s a good chance that your relationship with your denim shirt will outlive most marriages, it’s important that you commit to the right one and know how to get the most out of it. Affordability notwithstanding, there are still certain things to consider before putting your hand in your pocket. From the softer chambray to the more traditional Western shirt, there’s a lot of thought that goes into this seemingly simple garment. 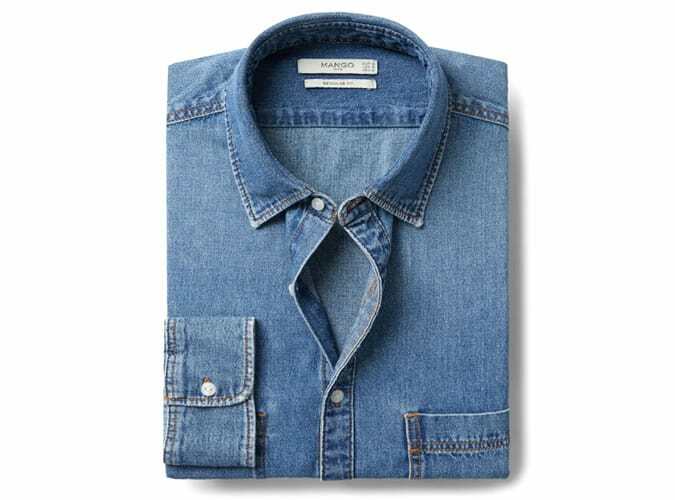 For a true denim shirt that doesn’t make you look like an off-duty rancher — no matter much you want to tap into the cowboy trend — it should be neatly cut, yet not so fitted that it resembles something you would wear in the boardroom. Whether you opt for a slim or regular fit depends on how you’re going to wear it. “A slim fit makes for a great layering piece, and works well underneath a jumper, tucked in to create a cleaner silhouette, or with the shirt tails on top of the jeans.” A regular fit cut with a bit more room, on the other hand, is ideal for throwing over a T-shirt or even light gauge knitwear. As with the jeans on your bottom half, the wash of your denim shirt comes down to personal preference. However, given that this is a piece with the capacity to be in your wardrobe for a lifetime, it’s better to go for a finish that won’t feel dated in a couple of seasons. In everyday terms, that means thicker western styles work best as part of a casual look, while softer chambray shirts are ideal for sliding under an unstructured blazer in a smart-casual office. When thinking about the weight of fabric, you should also consider when you want to wear the shirt. “I like a denim shirt in a lighter weight, but it only really works for summer. If you’re looking for a year-round piece, then I would go for one with a weight of 7-8oz,” says Kampe. Though it may be a simple wardrobe staple with very few bells and whistles, the devil is still very much in the details when it comes to the authenticity of a denim shirt. Despite being a symbol of non-conformity, wearing a lightweight denim and chambray shirt under an unstructured blazer is a move straight out of the menswear playbook. Just remember if adding a tie to pick a texture knitted style over traditional silk. For the tailoring-adverse, there’s ways to look smart without suiting up. “A rinse wash or a dry denim, buttoned up to the top, also looks very formal,” says Kampe. “However, the top tier would be a selvedge shirt with a selvedge pair of jeans. That’s the sartorial equivalent of your best bottle of wine in the basement.” Well, they don’t call it the Canadian tuxedo for nothing. Unsurprising considering its utilitarian roots, a denim shirt is an ideal layering piece for off-duty looks. “The biggest way that denim and flannel shirts differ from formal shirts is that you can get away with wearing them open” says Kampe, who recommends throwing a vintage-style or slightly oversized shirt over the top of a band tee. “That gives it more of an overshirt feeling and makes it super versatile.” That’s Friday night down the pub sorted, then. At the preppier end of the spectrum sits iconic American fashion brand Ralph Lauren. So sure is Mr Lauren of the excellence of his denim shirts, that he’s been known to close his own shows dressed in one as part of a double denim ensemble, featuring rodeo belt and all. One of the forefathers of the denim movement, heritage workwear firm Lee Jeans has a superlative selection of denim shirts. The brand’s authentic, premium 101 range is perfect for denim nerds who like their clothing with a side of historical accuracy. It’s no surprise that the brand responsible for inventing the denim jacket also does a nice line in denim shirts. While its mainline offering is excellent, if you want to channel the late, great Bob Marley, head to the Vintage section, which comes packed with a serious 1970s punch. When the shirts offered by most authentic denim brands are so reasonably priced, it can be a false economy to hit the high street for one. However, Mango is one of the few exceptions, with a selection of everyday styles that are all kinds of basket-fillingly-great. Despite starting life as a catalogue company, there’s nothing naff about this preppy brand. J Crew has a seriously stylish selection of authentic denim shirts that are crafted from premium Japanese selvedge. We guess indigo really is the warmest colour. The youngest brand from the H&M family, Arket crafts characteristically Scandi shirts from premium Japanese denim – think clean and crisp with unfussy finishes. These are the sort of wardrobe classics that will age as well as a Stilton, but without the pong. Another all-American brand backed up by decades of history, last year Wrangler celebrated 70 years of crafting brilliant denim. In 1974, its shirts became the first and only western wear to be officially endorsed by the Pro Rodeo Cowboy Association. And those guys know their denim. One of the newer specialists on the market, Replay celebrated its 40th birthday this year, which is relatively young in the world of denim. With a fresh approach to the fabric, the Italian brand’s Hyperflex shirts look truly authentic yet are blended with stretchy elastane to allow you to cut some shapes on the dancefloor.